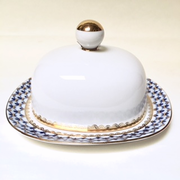 Cobalt Net bone china butter dish with lid. Blue and gold net detail design on rim of dish. Gold detail on dish rim and lid rim. Dish is 6 3/4" X 6".